Automatic Food Feeders does the trick by providing your pet dog with his meals periodically whenever you are out of the house. At PetsWorld we have Trixie Automatic Food Dispenser and PetBrands Auto Food Feeder for keeping your pet full and healthy. The Automatic Feeders allow you to feed only the desired amount of food to your dog and simultaneously control their food portions too. 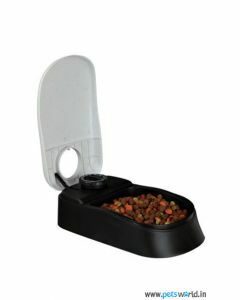 The feeders thus help to dispense the whole daily food intake of your dog in several small portions. Moreover, your pet won’t whine about food in the middle of the night making you sleep peacefully. Weight Management of pets is a big concern nowadays. Dogs like Labradors and Golden Retriever are obesity-prone as they have an overeating habit. The automatic feeders control your dog’s appetite thus helping to maintain a healthy weight. 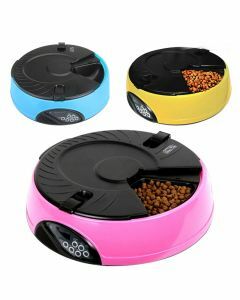 PetBrands Auto Food Feeder is available in multiple colours so that you can select your favourite one. Trixie Food Dispenser contains 1 Ice Pack for keeping the food fresh for a longer duration. It has got a rubber foot which prevents the slipping of the food.